The director of Google's self-driving cars unit says the vehicles have come a long way since the program started eight years ago, but that there's still no release date. Speaking Friday, the first day of South by Southwest Interactive in Austin, Texas, Chris Urmson said Google's autonomous cars have logged 1.4 million miles on roadways. And every week, they're going about 10,000 miles, nearly the distance a human driver travels in a year. However, they still have a long way to go: Google wants its cars to get to the point where they're better than human drivers. During his talk, Urmson walked the audience through a number of situations to show how the cars "think." About 10 times a second, one of the self-driving cars makes predictions about what objects are around it—bicycles, humans, other cars—and makes judgments about what to do next. "Instead of taking a four-hour flight to San Francisco … if you get in a car, maybe it takes you six or seven hours, but you get to enjoy a couple of movies and sleep in the car," he said. Being the law-abiding citizens the good people at Google are—remember "Don't be evil"?—Urmson said the cars are programmed to travel at the speed limit. There is, however, an exception: A driver on a freeway, for instance, can manually control the car to go a little bit faster than the car might on its own. "We actually think about this a lot," he said. "We've actually had interesting engagements. We've had a lot of vocal people who say, 'Geez, I'd never buy a car that doesn't break the speed limit,' but then we also get as many people who say how wonderful it is that the car drives the speed limit." 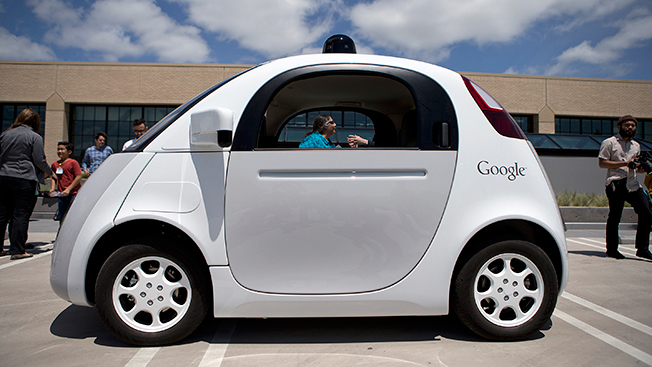 It's tough to say when Google will begin making cars available for purchase. It could be three years, and it could be 30 years, Urmson said. But, when the time comes, it's likely the vehicles will be rolled out incrementally, starting in areas with good weather. "The number one question I get when I give talks like this is, 'When can I get a self-driving car?'" he said. "For many people, this is a point of curiosity. There are people with health conditions—who are blind and can't drive, epilepsy, cerebral palsy … and many of us have parents or elderly friends who are at the point where we have to talk about how they can't drive anymore. And that's a crushing conversation." Last month, the inevitable finally happened: Google took the blame for a minor accident that occurred when one of its cars sideswiped a bus in California. Nobody was injured in the crash, but Urmson said his team is learning a lot from the accident. Since then, Google has run 3,500 tests with the software to make sure the same situation doesn't have the same outcome next time. "This was tough for us, and we don't like our cars bumping into things," he said. Some people who encounter Google cars seem to feel a sense of liberty around them, acting in ways that go against social norms, presumably because there are no drivers watching them. Urmson said cars have seen human-driven vehicles going down the wrong side of the road, one man hop on and off a self-driving car, another man streak around one and an elderly woman in an electric scooter chasing ducks in the road with a broom. "We've seen people play Frogger," he said.